DFCCIL Executive Result 2018 – The candidates who are looking for the DFCCIL Result 2018-19 would find all the details pertaining to the DFCCIL Executive Civil Result here on our page. We have also given information concerning the DFCCIL MTS Merit List and the DFCCIL Result (Executive) 2018 cutoff. All those aspiring employees of the Dedicated Freight Corridor Corporation of India (DFCCIL) would be waiting for the DFCCIL Result to come up as soon as possible and since the DFCCIL Exam Date was on the 11th, 12th, and 13th of November 2018, it is high time the organization releases the result of the examination conducted. Result for the post of Executive(Civil) has been declared on the official website! The Provisional Merit List (candidates shortlisted for the document verification and medical examination) has come out. The Results for the other posts like Executive/Signal and Telecommunication, Junior Executive, Multi-Tasking Staff have not come out yet. Check if you have been selected or not by going to the “How to check Result” Section which is given below. 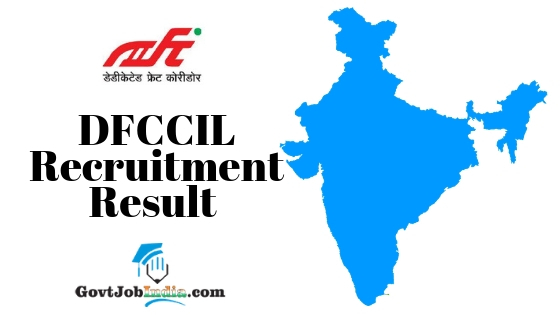 How to get your DFCCIL Various Posts Results 2019 Online? When you are on the Home Page, begin by searching for the DFCCIL MTS Executive Result 2018 Download link. In the DFCCIL News section, open the DFCCIL Junior Executive Result 2018 Link which will be there in that same section. Enter your date of birth and click on submit. After this your DFCCIL MTS Junior Executive Exam Results 2018 will be on the laptop/ computer screen. Download (CTRL+D) your DFCCIL Results 2018 and Save in Pdf format. Now finally, take a photocopy of DFCCIL Executive Results 2018 Pdf for future reference purpose. Candidates can also start by going to the link given below and then follow from step 4 onward to get your result. This page summarizes the useful information related to the www.dfccil.gov.in Recruitment 2018 and how the recruitment process took place along with the expected dates for the releasing of the DFCCIL Result Date 2018. The DFCCIL recruitment 2018 which started its application procedure on the 1st of August 2018 saw the end to the application procedure on the 31st of August. With a large number of applications coming in from all across the country, the 1572 posts were a gamble when it came to the selection procedure. But the organization made sure that only the best got selected with their Computer based Test and the main examination which will be conducted soon. So, all those who have written the DFCCIL CBT Exam for the posts of Multi-Tasking Staff, Junior Executive and Executive will be happy to note that the result will be out soon! Though the dates have not been finalized by the DFCCIL, the result will tentatively be out in a few days or maximum in a few months. Candidates are urged to stay tuned to this page by bookmarking this page to your favorite browser so that you can access the DFCCIL result 2018 as soon as it is out. The cut off marks of the DFCCIL hasn’t been declared as of yet. We will be updating our page about the DFCCIL Cut Off as soon as it is out. But for the time being we have given below the expected cut off of the year 2018 which will give you a rough idea about the cut off this year. For updated version of this page, make sure to bookmark us and keep checking us to find out. Meanwhile, the DFCCIL cut off will be based upon the following factors. These are numbered down below. The merit list will specify all the names of the candidates who have been selected for the DFCCIL Jr Executive Recruitment 2018. If your name features on the merit list, this means that you have qualified for the next stage of the recruitment process. Which means that you will be able to qualify for the entire recruitment process if you pass through the final stage of the recruitment as well. We wish you all the best for the DFCCIL MTS Result and we hope that the DFCCIL Result Executive 2018 Cutoff and Merit List are in your favor. If you liked this article about the DFCCIL MTS Executive result 2018, the make sure to share it with all your friends who might have appeared for the same. Also, in case of any doubts or difficulties in accessing the result, make sure to comment down below and let us know and we will help you to the best of our abilities as soon as possible. Furthermore, don’t forget to subscribe to our website which is GovtJobIndia.com and also bookmark us onto your favorite website for prompt updates about the latest govt job recruitment across the country. There will be normalization or not in DFCCIL Exam. Plz confirm….